Grinding stones designed for ink-attracting copper surfaces have to perform an extremely responsible task. Conventional ceramically bound grinding stones or silicon carbide grinding stones are only fit for this purpose to a limited extend. They are rather suitable for coarse grinding work but do not meet up-to-date demands. 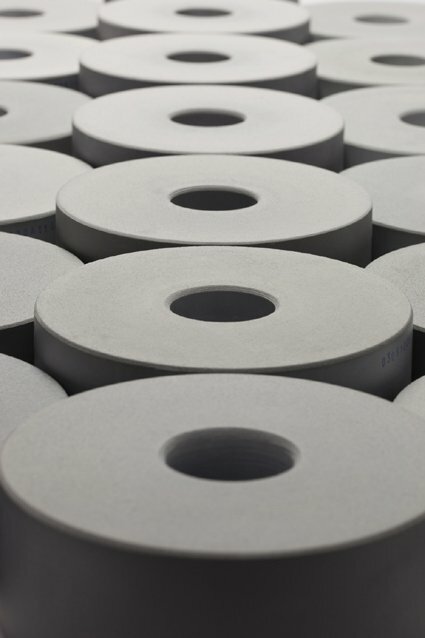 By comparison, the proven embedding of our abrasive grains in tough foamed synthetic material makes for the durability of the Rotocalco grinding and polishing stones in addition to an outstanding cutting performance when achieving fine roughness values. Our particular synthetic material has been developped especially for the stones mass in order to assist in the defined continuous removal of worn out abrasive particles. This self-cleaning effect allows the long-lasting use of a stone surface providing ideal grinding properties. Spring-mounted abrasive wheels guarantee an even grinding pattern without chatter marks, score marks or other irregularities. Uncontrolled material abrasion and undesired clogging on the abrading stone surface is avoided, and no post processing is necessary.